What would you say to a calm, dream-like break that is both relaxing and stimulating? VR goggles can also be a means to an artistic experience. Instead of being deluged with stimuli in the way that plagues the world of games, you find yourself in a pleasing virtual reality accompanied by classical music and sighing human voices. The story has no dialogue, so you can let your imagination take flight. Technology is revolutionising our lives, but this is not the first time we have found ourselves in a rapidly changing world. The amazing early 1930s introduced colourful neon signs to the urban scene, along with towering buildings and noisy transport. One of the most mind-blowing moments was experienced in autumn 1930, when an airship 236 metres long flew over Helsinki. Crowds gathered in Helsinki to wave to the Graf Zeppelin as it approached from Latvia and Estonia. Hats and handkerchiefs fluttered excitedly down by the deep-water harbour and in Senate Square. A landing site had been cleared in the fields at Viikki. The modernism born in the first half of the 20th century sought to shake up the prevailing system. It pointed the way to a new future. Settling in Helsinki on his return from abroad, Ernest Pingoud the composer found himself in an industrialising city. This new city blazed with bright light, transport was becoming motorised and machines clattered. Pingoud’s La face d’une grande ville (1936–1937) was the first Finnish work describing urban life. It could be film music if anyone had thought of it back then. New movies, ground-breaking music, modern architecture. A hotel reminiscent of a skyscraper towered in among the surrounding blocks of flat and naturally caused a stir. The experiences were as inconceivable to people then as the virtual world is today. The three-minute 360 Faces of the city was born of a desire by Yle graphic artist and animator Kirsi Kukkurainen and producer Katri Henriksson to visualise classical music in a new way. What potential did VR goggles have? How might classical music enhance the experience? What other sorts of sounds might be required? The performance by the Finnish Radio Symphony Orchestra of Pingoud’s La face d’une grande ville was chosen as the soundtrack for the VR work because of the strong visual imagery it evoked. The mood created by the music occupies a special role in this three-part VR experience. VR goggles also permit a spatial experience. The first part, The Abandoned Street, views the city from the air, in between coloured clouds. The moon is shining and the stars are twinkling. The wind whispers and the city rumbles in the distance. Part 2, Factories, jostles the viewer into the hectic traffic. You are surrounded by streams of cars to the rhythm of feverish music. Cars spit out sparks and colourful streamers of light. The city is like a factory that never grinds to a halt. In part 3, Statues and Fountains, the Zeppelin glides across the sky, at first mysteriously, as ships hoot their foghorns out at sea. As the airship passes over Senate Square, rose petals start floating on the air. History, the present day, a spatial dimension and classical music. What else might be needed to enhance a virtual experience? The 360 video stiching and computer-generated imagery was the work of the Zoan production company. The makers got together and came up with the brilliant idea of using the human voice. Traffic, the whispering wind, the rumbling Zeppelin and the foghorns out at sea are mysterious sounds. We can only imagine how the city sounded to the people of 1930s Helsinki. All the sounds in the virtual work were produced by humans. Voice artist Rudi Rok spent two days with sound designer Anders Wiksten in the Yle radio-play recording studio. Rudi Rok sighs as the Zeppelin sails over Senate Square. His sighs express the excitement as people watch the enormous airship. The aim is for the urban sounds created with the human voice to strike to the very core. 360 Faces of the city appeals to the imagination. It provides a musical journey, the timeframe of which is left for each to decide. But let us go back in time to the historic moment, that Wednesday in 1930 when the huge German airship glided over Helsinki, intending to land at Viikki. Maybe the wife of the German Consul was looking out for it on Annankatu. At least favours literally rained down on her from the sky. 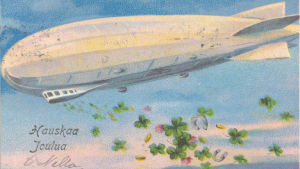 Flowers and boxes of chocolates are said to have been tossed to her from the airship. But Helsinki was already a windy place back in 1930. The crowds gathered on the landing site cleared in the fields at Viikki were obliged to sigh in disappointment when a sudden gust of wind blew the Zeppelin away beyond the forest. The airship was never able to land in Helsinki. Instead, it continued its journey to Stockholm. 360 Faces of the city had its premiere in the exhibition Suruton kaupunki (Carefree Capital. Scenes from 1920s Helsinki) at the Villa Hakasalmi during the Lux Helsinki festival of light, January 5–9, 2019. Neon signs on Helsinki’s main street, Heikinkatu (nowadays Mannerheimintie) in the 1930s. Photo: Pietinen Aarne Oy 1935. 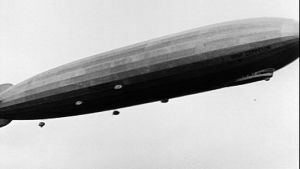 The airship Graf Zeppelin visited Helsinki in autumn 1930. Photo: Rafael Roos. Kalevankatu, Helsinki and the Torni Hotel in the early 1930s. Photo: Olof Sundström. The Bio-Bio cinema at the New Student House. Photo: Olof Sundström.